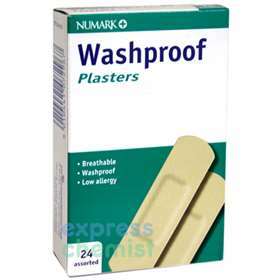 Numark Washproof Plasters - Individually wrapped plasters for superior hygiene and contamination-free wound protection. Numark Washproof plasters provide ideal protection for wounds in wet conditions. The washproof backing is micro-perforated enabling air to penetrate the wound, aiding the healing process. Includes 3 38x72 mm, 12 19x72 mm and 9 19x38 mm plasters.